City’s New Signing Demichelis Sidelined for Over One Month. 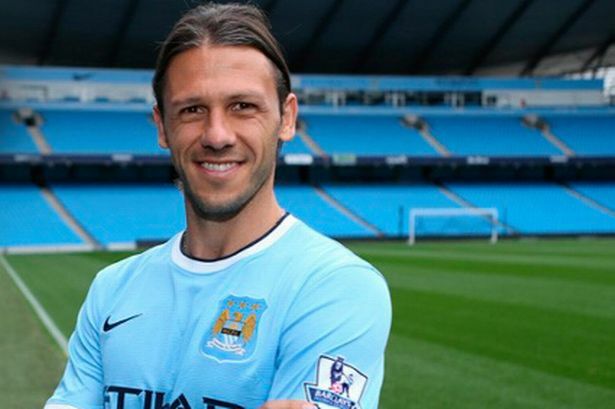 New Manchester City signing Martin Demichelis has been ruled out for around six weeks with a knee injury. Martin Demichelis Out for Over Six Weeks Due to Injury. The Argentina international moved to the Etihad Stadium from Atletico Madrid in a £4.2m deal last Sunday. He joins Belgium international Vincent Kompany, who is expected to be sidelined for another three weeks with a groin injury and Englishman Micah Richards, who has a hamstring strain, on the sideline. Serb Matija Nastasic, 20, and England international Joleon Lescott are the only recognized centre-backs in coach Manuel Pellegrini’s side at the moment. The 32-year-old Argentine, who has 37 caps on the international stage, played under Pellegrini at Malaga and River Plate before reuniting with the Chilean at the Manchester club after just two months with Atletico Madrid. He is expected to miss Premier League matches against Stoke City, Manchester United, Everton and Aston Villa; plus Champions League ties against Viktoria Plzen and Bayern Munich. Expect More of Ramsey’s Phenomenon, Says Wenger. Previous articleWorld Wrestling Body, FILA Cautioned By IOC for “Minor Infringement” of Bidding Rules.